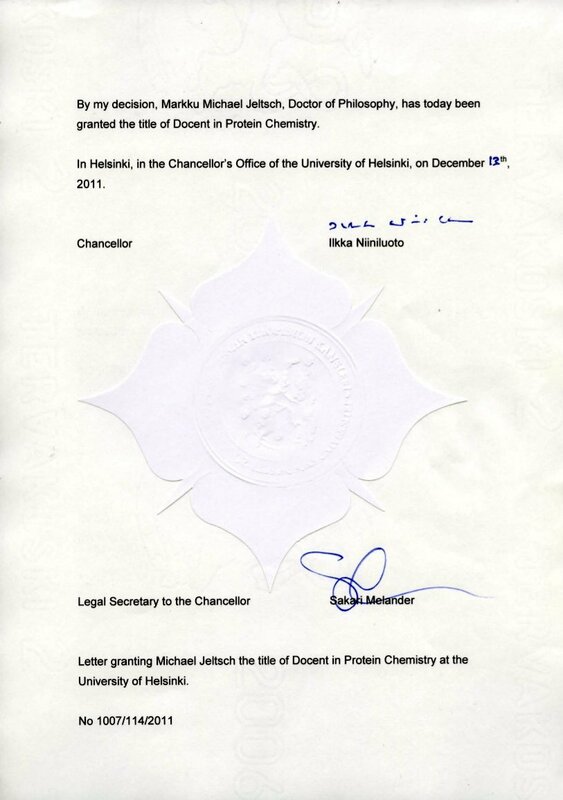 Since December 13th, 2011, I am an adjunct professor (Finnish: dosentti) at the University of Helsinki. This is not a tenured position, but a title, which requires a certain amount of scientific success after completing the PhD and teaching experience (more about this in Finnish). The Suomen Dosenttiliitto (Finnish Association of Adjunct Professors) recommends to translate the Finnish word "dosentti" with the English "Adjunct professor". Although the Finnish Academy of Sciences follows this recommendation, the University of Helsinki seems to stick for the time being to the old translation "docent" ingoring that there is no academic title "docent" in the anglo-american world. Both translations can be misleading, suggesting a (tenured) position, which it is by no means. A good translation is the German "Privatdozent", because it also does not imply a postion at the university and the procedure to receive the title is similar to the Habilitation in German-speaking countries. However, unlike in German-speaking countries (and unlike for the PhD), no actual public defense takes place. Instead, you have to gather what is called an Academic portfolio, which is evaluated by two independent experts from your field of research. Here is what I did in 2011 in order to get the title. And here you can see who got the title from the University of Helsinki during the last year.